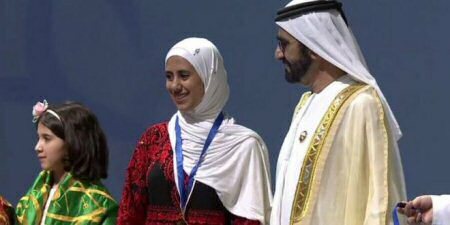 Arab Reading Challenge crowned as winner a 17-year-old Palestinian girl who beat 7.4 million contestants to win this year’s title as the champion of the contest in Dubai. Afaf Sharif was crowned during a grand ceremony held at the Dubai Opera House, and received Dh550,000 in prize money, PNN reports. Afaf outperformed thousands of students who participated in the competition in Palestine, and was chosen from among 5 finalists and 16 semifinalists. Vice-President and Prime Minister of the UAE and Ruler of Dubai, Shaikh Mohammad Bin Rashid Al Maktoum, honored the winners of the competition’s various categories and presented their awards. Sherif Sayed Mustafa, from Egypt, came in at second place, and Hafsa Al Danhani. from the UAE, came in third after the audience took part in an instant voting poll, choosing Afaf as the first winner of the competition. The top 20 finalists from Arab and other non-Arab countries were also honored, according to GulfNews.com.